Gut flora, gut microbiota or gastrointestinal microbiota is the complex community of microorganisms that live in the digestive tracts of humans and other animals, including insects. The gut metagenome is the aggregate of all the genomes of gut microbiota. The human gut is home to trillions of microorganisms, and there is a vast diversity within this gut microbiota. The composition of human gut microbiota changes over time, when the diet changes, and as overall health changes. Recent studies have found that the gut microbiota plays a vital role in neurodegenerative disease. Neuron destruction processes in the brain could be triggered by proteins produced by gut microbiota. It was also reported that the bacterial proteins called amyloids could increase clumping of a protein produced by the brain (alpha-synuclein), forming harmful aggregates that damage neurons in patients with Alzheimer's, Parkinson's and Amyotrophic Lateral Sclerosis (ALS). It is also found that amyloid proteins produced by microbiota may cause priming of immune cells in the gut, increasing inflammation in the brain. 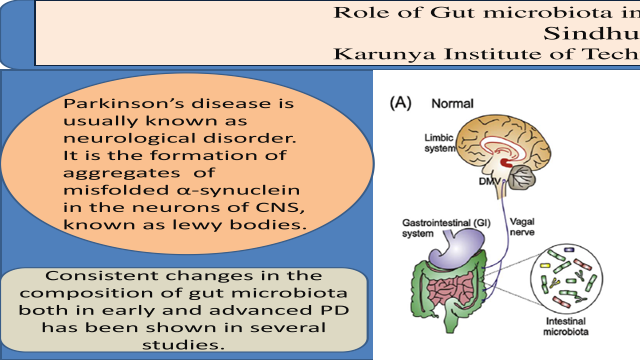 This review paper would discuss about the mechanisms that mediate the communication between the gut and the brain with respect to Parkinson’s disease.